The Net Neutrality argument is heating up once again. There is so much to learn and so much to understand, but I have compiled several articles that should help you gain a better understanding of it. In addition I have a link to the page that will help you find protest locations- either to join or stay away from depending on your point of view. Protesters target “Verizon’s puppet FCC” in demonstrations at Verizon stores. Net neutrality supporters plan a nationwide series of protests starting Thursday outside Verizon stores, where they will express their opposition to the pending repeal of net neutrality rules. You can find local protests by going to this webpage and searching by ZIP code. Verizon stores aren’t the only places where there will be protests. In Washington, DC, for example, there will be a protest at the annual FCC Chairman’s Dinner on Thursday. There will be another protest outside the FCC building on December 13, one day before the vote to repeal net neutrality rules. Many protests will be happening on Saturday as well. Protesters chose Verizon stores because Federal Communications Commission Chairman Ajit Pai was associate general counsel at the company between 2001 and 2003. Verizon has been a longtime opponent of net neutrality rules, having filed the lawsuit that led to a previous version of the rules being thrown out by a judge. The protest organizers are advocacy groups Fight for the Future, Demand Progress, and Free Press Action Fund. There could be some protests at the FCC meeting as well. Net neutrality supporters disrupted an FCC meeting in April this year with a “Rickroll”; they sang Rick Astley’s famous song but with modified lyrics proclaiming their love of common carriers. There were also protests at a May 2014 meeting when the FCC was considering rules that would have allowed ISPs to charge websites for prioritization. 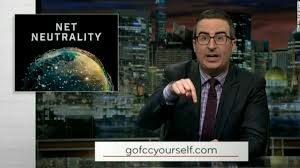 The FCC eventually prohibited paid prioritization along with blocking and throttling in February 2015, but those rules are now being repealed by Pai’s Republican majority. If you want a reaaalllly looong but good explanation here is THIS one from ZDNet.com.